Donated when she was three years old. 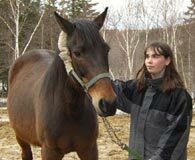 Was a terrific saddlehorse until she injured a knee at 15 years, now she is a terrific broodmare and mother. Her foals are Finally, Ramona, Mocha and Oh Oh and a new foal will be here in the summer.